The Sandhills Were Created for Golf! Welcome to the Sandhills! This is the place where legends not only have played, it's the place where memories are built. With 43 golf courses within a 25 mile radius, you will not be disappointed. With courses designed by Donald Ross, Rees Jones, Arnold Palmer, Jack Nicklaus, Gary Player, Ben Crenshaw, Tom Fazio and Ellis Maples, every golfer will find their own favorite. Our Vacation Rental division can plan your entire vacation from accommodations and tee-times to transportation and even dinner reservations at any of the local restaurants. Don’t want to leave home? We can organize your dinner party with a personal chef. 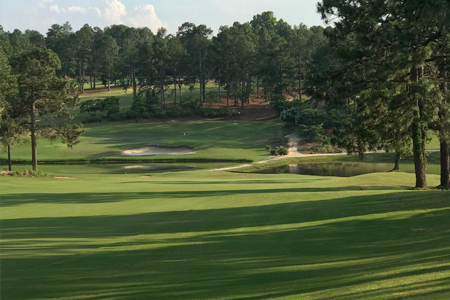 Whether you're looking for a quick weekend golf getaway, cooridnating an annual guy's golf trip, coming to the Sandhills area for a month and want to sprinkle in a round or two or anything in between, we've got you covered! Golf package coordinator Todd Camplin will create the perfect trip to fit your needs. Todd is a PGA Member who has lived in the Pinehurst area since 1999 and will take time to find out what is important to you so your trip will hit on all the notes. Check out the packages below or submit a custom form outlining the details of your trip to receive a quote. We are all about creating lasting memories! Interested in a vacation rental or a custom golf package call or email today! Stay in one of our 2 Bedroom – 2 Bath golf-front condos and enjoy golf at 7 Lakes Golf Club, Hyland Golf Club and Foxfire Resort. Price includes all taxes and fees, including a departure cleaning fee. All linens and towels provided. Weekday or weekend. Prices are per person, based on quad occupancy and subject to availability. Courses and accommodations can be upgraded, please call for more information.